Nicholaus Germanus, mistakenly called Donis or Donnus as a corruption of Dominus, was a Benedictine monk from Reichenbach. He died in 1471. He created a map projection, with rectilinear equidistant parallels and meridians converging toward the pole, on which he reproduced the original Ptolemy maps. 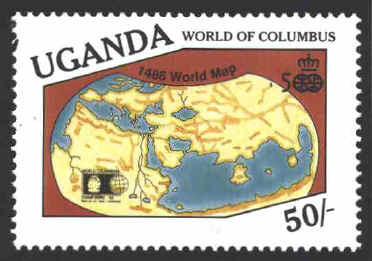 His maps were engraved and published in several editions beginning with one published in Rome in 1478. The maps were published under his own name in 1482 and 1486 in Ulm. The world map was “engraved by Johannes, sculptor from Armsheim,” and is the first printed map that is signed. 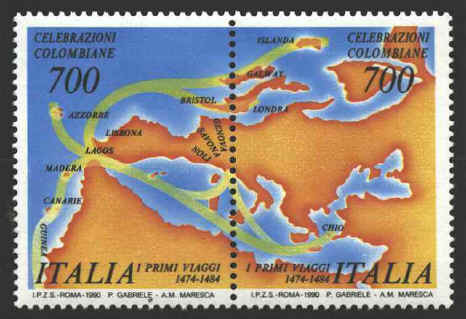 The routes of the early voyages of Christopher Columbus are marked on a world map based on the 1482/1486 Ulm editions published by Germanus. Columbus’ voyages to the eastern Mediterranean, to Chios, are his earliest. In 1476 he was part of a Genoese convoy protecting a commercial shipment to Lisbon, England and Flanders. In August the convoy was attacked off the Portuguese coast. Columbus was wounded, swam to shore and was rescued by the people of Lagos. In 1477 he went to Madeira to buy sugar. On his return he married Dona Filipa de Perestrelo e Moniz and moved to Madeira. His last voyage during this period was to São Jorge de Mina (Elmina) on the west coast of Africa in 1484.